This set of Control Systems Multiple Choice Questions & Answers (MCQs) focuses on “Stepper Motors”. 1. A variable reluctance stepper motor is constructed of ______________ material with salient poles. Explanation: A variable reluctance stepper motor is the motor that has motion in steps with respect to increase in time and constructed of ferromagnetic material with salient poles. Explanation: Pole pitch is defined as the number of armature slots to the pole pitch and here this has been converted into degrees. 3. A stepper motor having a resolution of 300 steps/rev and running at 2400 rpm has a pulse rate of- pps. Explanation: Pulse per second is mathematically given as PPS = (Rpm/60)*(number of steps per minute). Explanation: Step angle is defined as =(Ns-Nr)/(Ns+Nr)*360. Explanation: The rotor is the rotatory part of the motor of a stepper motor and has no windings, commutator and brushes. 6. A stepping motor is a ____________ device. Explanation: A stepping motor is a motor in which the motion in the form of steps and is a incremental device i which as the time increases the steps are increased. d) Magnitude of stator current. Explanation: The stator part of a motor is the stationary part of the motor and rotational speed of a given stepper motor is given by the step pulse frequency. 8. Which of the following phase switching sequence represents half-step operation of a VR stepper motor ? c) AB, BC, CA, AB……..
d) A, AB, B, BC…….. Explanation: In the half step operation of a Variable reluctance motor physical step resolution is multiplied by 2 and control signals appear to be digital rather than analog. 9. A stepper motor may be considered as a ____________ converter. Explanation: A stepper motor is a motor in which the motion is in steps and it is an increemental device and may be considered as a digital to analog converter. 10. What is the step angle of a permanent-magnet stepper motor having 8 stator poles and 4 rotor poles? Explanation: Step angle is defined as =(Ns-Nr)/(Ns+Nr)*360 where Ns is the number of stator poles and Nr is the number of rotor poles. 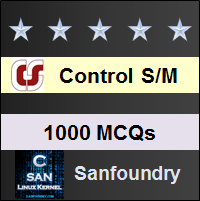 To practice all areas of Control Systems, here is complete set of 1000+ Multiple Choice Questions and Answers.